Bonneville Power Administration chooses XR Geomembranes as above ground secondary containment solution. The Bonneville Power Administration (BPA), a major provider of electric power in the northwestern United States, has recognized the necessity of providing secondary containment at electrical substation facilities. However, because substations vary substantially in size, complexity, and the number of transformers, BPA needed a flexible membrane liner that was easy to install in a variety of configurations. XR-5 geomembrane manufactured by Seaman Corporation meets these requirements and is durable enough to withstand the toils of heavy equipment service traffic. 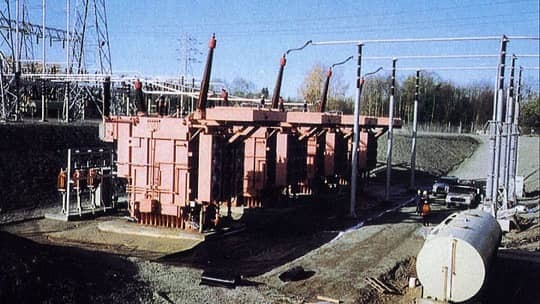 Substations typically contain numerous oil-bearing transformers which sometimes have very low levels of PCBs that could contaminate the soil below if a spill or leak occurred. To prevent contamination, environmentally sensitive power companies install above ground secondary containment systems with high chemical and oil resistance to contain any spills or leakage of oil. Requiring only simple hand tools, the XR-5 is attached to existing transformer foundations using a basic metal battening system. The flexibility of the XR-5 allows the material to fit virtually any configuration. Plus, the substrate fiber makes it durable enough to withstand frequent service traffic, continual foot traffic, and extreme temperature variations. And its laboratory-tested strength withstands constant exposure to UV rays and hydrocarbon chemicals.